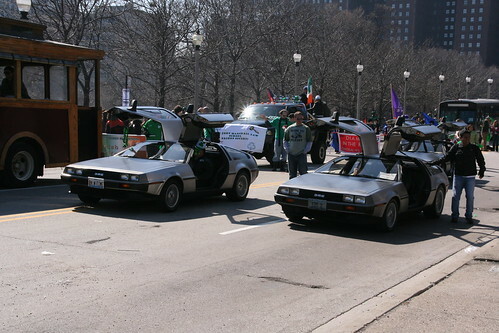 At the end of the St Patrick’s Day Parade in Chicago last Saturday, they had three DeLorean cars! As a fan of the Back to the Future movies and someone who had never seen an actual DeLorean before, I thought this was very cool. 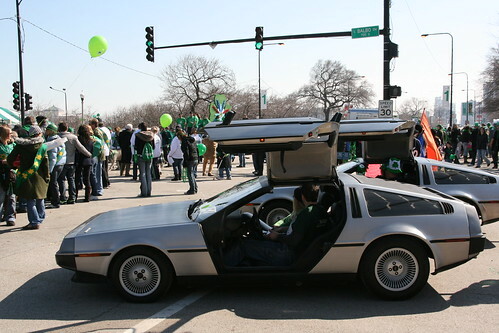 Only approximately 9,000 of these gull-winged cars were made in 1981 and 1982 by the Delorean Motor Company in a factory in Northern Ireland, hence these Irish cars were in the parade. 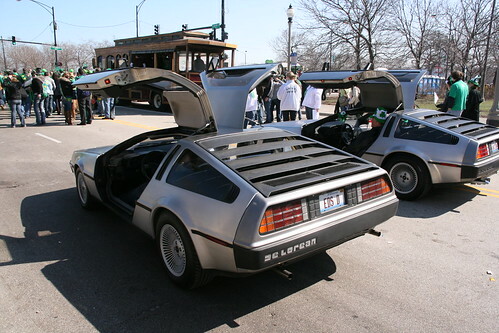 Only about 6,500 DeLorean DMC-12s are believed to still exist today. Six DMC-12s were used in the making of the three Back to the Future films. For the second and third films, producers replaced the underpowered stock engines in their production cars with Porsche engines. Doc Brown’s rationale for choosing the DeLorean was stated in the first film: “The way I see it, if you’re gonna build a time machine into a car, why not do it with some style?” The choice of the DeLorean was actually for the purpose of a gag in the film that occurs when the car arrives in the year 1955 and is mistaken for an alien spacecraft due to its futuristic look. The time machine in the movie has the license place OUTATIME. 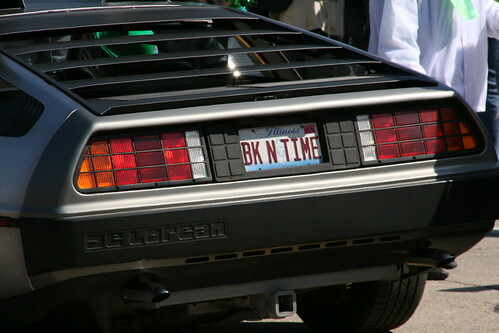 One of the DeLoreans in the parade had an Illinois plate BK N TIME (‘back in time’). One of the DeLoreans used in the third Back to the Future film is now hanging from the ceiling at the Planet Hollywood in Honolulu, Hawaii. And apparently (I just found out) another one of the six cars used in the movies is at the Historic Auto Museum in Roscoe, Illinois. Whoa, that’s not far from here! 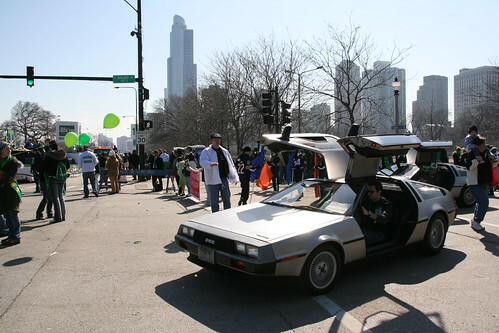 A few people who own a DeLorean have modified it to make it look like a time machine. They’ve made their own flux capacitor and time circuits. You can find one here and here. Pretty neat, he? This entry was posted on Tuesday, March 17th, 2009 at 2:16 pm CET and is filed under Chicago, Illinois, Movies, Pop culture	with tags . You can follow any responses to this entry through the RSS 2.0 feed. You can leave a response, or trackback from your own site. Or go to to rent a DeLorean.